Imagine how impressive the waterfront will be once all the dirty doo-doo is cleaned out of the harbour. Waste management gruesomeness aside, exciting things are happening down at our waterfront that should impress tourists---and locals too. NSCAD recently unveiled architectural plans for a new 70,000 square-foot open-concept campus with an impressive black zinc and glass façade. With Bishop’s Landing, the boardwalk, Pier 21, Mary E. Black Gallery and Garrison as neighbours, plus the Cunard Centre packing them in at events, the waterfront puts the class in world class, baby. 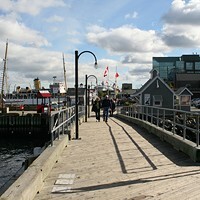 Halifax Waterfront.